Rich Dad Poor Dad by Robert T. Kiyasaki, was first published in 1997. And immediately climbed the bestsellers chart. And even after 20 years, it remains popular! Though, if you search the net for reviews or share the idea of reading it, people’s response varies a lot. Some would downright reject the idea, calling it a blab about riches without a single proven theory. Yet others would be cynical of the stress on money, while there are so many other aspects of life that one has to look after. And yet others would begin to read the book enthusiastically, hoping for a magic formula to create money out of thin air and then be sorely disappointed. I am sure, whosoever had read the book, looking for easy way to get rich, is bound to feel this way. As this book is not about making quick bucks, rather it is written with an intention to change your attitude about money, power and your own life. Sadly, most of us pass through our lives, without realizing our full potential, shortchanging our talents for peanuts and then feel offended with anyone who dares to show us mirror. And, ironically, I liked Rich Dad Poor Dad, precisely because of the fact that it dares to show mirror to its readers, to make them realize their follies, and then instead of giving a shortcut to solve their problems, hand them over a sugarcandy “Don’t work for money, let money work for you”. Yes, I can understand how irritating it would be for readers, to have all their assets viz house, cars, deposits be branded as liabilities and ask them to take risks, hanging onto words of an author, who loves to talk in phrases and dialogues! But to tell you the truth, this roundabout approach is what I loved about the present book. Life changing lessons can’t be given as handouts, one has to work his mind muscles and develop the right attitude, to gain wisdom. And, Robert Kiyosaki continuously prod his readers, towards making that attitude-shift towards investments, savings and incomes, which would finally bring about any change in life. And, to drive his point home, Robert has modeled the storyline of Rich Dad Poor Dad, on his own life. His real father was a highly educated teacher, whom he calls his Poor Dad, while his friend Mike’s father, who was a school dropout but an ingenious businessman, is referred to as Rich Dad. Here, the point to be noted is that the tags Poor Dad and Rich Dad, apply more to the attitude of these two men towards life, rather than only about the amount of money they possessed. And, as Robert himself confesses in the book, he learnt a lot about life from both his Dads. Both of them were his mentors, though the lessons he learnt, were his own derivatives of what they preached. And, more than anything, I fell in love with this approach. Each failure or flaw, whether our own or of our loved ones or a total stranger, can teach us a lot about what to avoid. And, in life, learning from failures is more beneficial and long lasting than feeling proud of small successes. It goes without saying that I loved this book, though I did find that Robert dwelled at certain points for too long or kept on repeating himself at regular intervals, I am ready to overlook his minute flaws as a great writer and rather gather those few blocks and create my own skyscraper. The book has inspired me to believe in my talents and go with my gut feeling, take risks and make my life, what I want it to be. Money is essential but power is what rules the roost. The power of belief, the power of turning the clock in your favor. 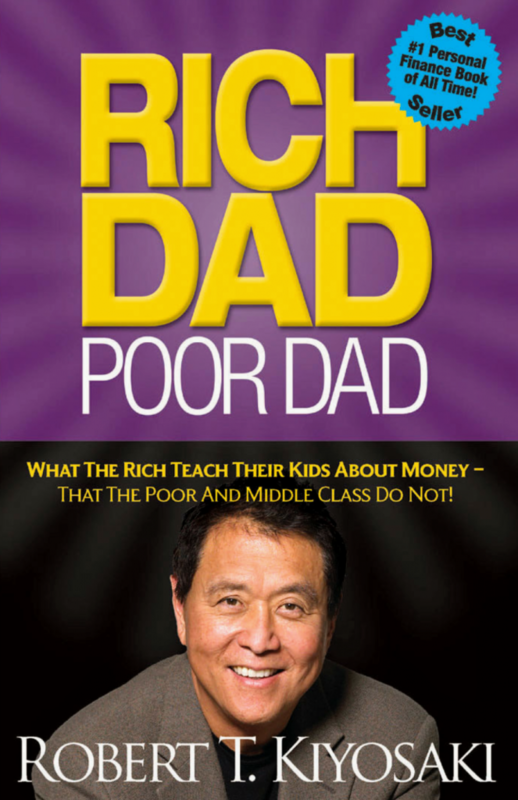 Loved reading Rich Dad Poor Dad, and perhaps would continue to refer it in future.